The next three books on my list don’t have a terribly large amount in common. I’ve got one post-apocalyptic dystopia, one British spy novel, and a clockwork Armageddon. Hmm… all three have disguises in them. And spies. I’m going to say that they’re all tied together with spies. Haha! A theme! Ok, let me start with this… DAN WELLS IS COMING TO MY BOOKSTORE!!!!!!!!!!!!!!!!!!!! Right, now that that’s out of the way I can stop being a squealing fangirl and be serious. Well, serious-ish. Partialstakes place in a post apocalyptic world. Partway through the 21st century a company named Para-Gen developed synthetic humans. They were called partials and were dispatched to fight our wars for us. But when they came home they rebelled. A devastating war ensued and humanity was losing. Then the worst blow of all struck. A virus was loosed that wiped out all but a handful of the remaining humans. It is now eleven years after the RM virus decimated humanity. The few thousand that remain are huddled on Long Island. The Partials have not been seen since the virus attack, but everyone knows they are out there, waiting. However, all is not well with the survivors. Although everyone in the settlement is immune to RM the same is not true of their children. No babies have survived more than a few days since the attack. Humanity is on the brink of extinction. In an effort to combat RM the government has instituted a mandatory pregnancy policy for all women over the age of eighteen. Their plan is to play the odds. Surely one of the babies will live? Kira is sixteen. She is a medic in the maternity ward, another term for hell. She believes that there must be a solution. All of the doctors are looking at the babies themselves. All the research is aimed at why they aren’t immune. Kira thinks that the solution must lie with those who are already immune; the survivors and the Partials. No one still alive knows much about the Partials. The information on their development was lost during the war, but if they designed the RM pathogen then they must hold the key to curing it. Kira and her friends hatch a bold plan. They will capture and study a Partial. But how can you find a Partial? They look just like regular people. True, they’re stronger, they heal faster, and they don’t age. But none of these traits are easy to check on a casual acquaintance. So Kira decides that the only way to ensure that she gets a Partial is to go into their territory and find one. When she does it only raises more questions. This book is brilliant. Kira is a very well thought out character. She is brilliantly smart and passionate, yet believable sixteen. Her friends are all convincing. I could see people I knew in them all. 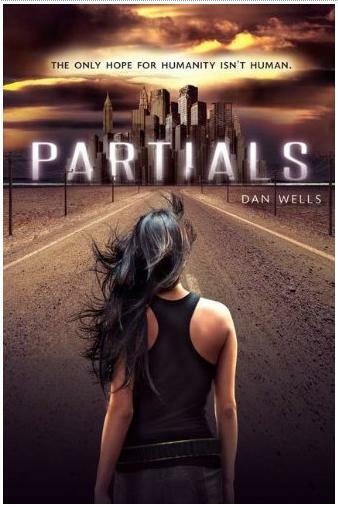 Wells makes the Partials a convincing threat, but when you find out more about them they become so much more than two-dimensional villans. They are, to put it bluntly, human. I love that. It always bothers me when I’m reading a book and the villan is too… evil isn’t quite what I’m looking for. Pat maybe? Outside of fantasy where villains are supernatural archetypal forces of evil I have trouble with the concept of someone who is bad just because. That’s lazy. There has to be a reason that the villain is a villain. And most villains don’t think of themselves as evil. They think of themselves as the hero. Wells has done an amazing job of creating several different forces all acting at odds and all believing that they are doing the right thing, the only thing. Everyone wears a grey hat in this story because right and wrong aren’t easy to determine. I highly recommend it. And, it’s the first in a series, which makes me very happy. He is also the author of the John Wayne Cleaver series and has a new book coming out in July called Hollow City. And he’s coming to the Little Professor on July 6 for a signing!!!! So, I am a die-hard Agatha Christie fan. My mom and I started watching the Joan Hickson Miss Marple series when I was a child. I have almost all of the Agatha Christie adaptations that are out on DVD. I have read almost all of her books. Passenger to Frankfurt was one that I had missed. Now I know why. Christie is a crime queen. There is no denying that. She scripts an amazing who-done-it. She writes charming detectives. She is not, however, a master of the spy novel, which is what this book ostensibly is. Our protagonist, Sir Stafford Nye, is a bored, occasionally playful diplomat on his way home from a stint in Malay. At the Frankfurt airport he is approached by a seemingly familiar woman who begs for his help. Her life is in danger. The only way to save her is for her to fly to London on his passport, dressed as him. He, in turn, will stay in the departures lounge at Frankfurt under a sedative. The story will be that he was knocked out and robbed. She will be safe and he will be mildly inconvenienced. Ok, so far so good. This is interesting, I think to myself. But that is the last event that occurs with clarity and speed. Sir Stafford returns to England. Some time passes. His clothes and passport are mysteriously returned to him. He meets his mystery lady again, but she is now an obscure Eastern European noblewoman. Or is she Mary Anne, the darling of the British espionage world? She seems to be several different people. And he, somewhat like a large puppy, follows along in her wake. She leads him to Bavaria where a repulsively fat Countess is trying to rekindle the Nazi order using youth uprisings. The narrative switches from Sir Stafford, to his great-aunt, to various men in government. No one, including the reader (and possibly even the author) is sure of Sir Stafford’s motivations. The narrative skips around. Suddenly we’re at a music festival, then an embassy under attack. This book seems to be Christie’s attempt to write a “modern” (for 1970) spy thriller and not really knowing how to go about it. 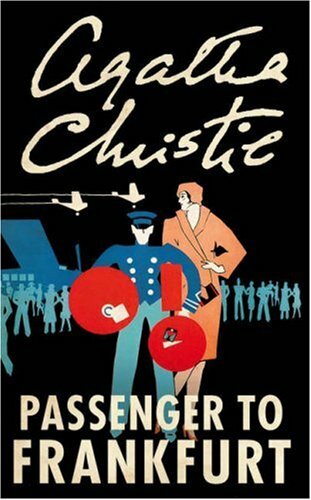 Christie wrote 82 books under the name Agatha Christie. I have read probably 70 of them. Thus far, this is my least favorite. Ok, a few things about Angelmakerthat are totally awesome. First, the cover. Not only is it a very cool cover, but it has a code in it! The awesome designers over at Knopf actually designed a secret message and encoded it into the cover. So that’s awesome. The next awesome thing is the book trailer, which you can watch here. It makes me happy. I’ve probably watched it 10 times. I’m like that. So, those are awesome things about the book. Now, let me tell you about the story. Our markedly mild mannered hero is Joseph Spork. He is the son of a fairly famous chanteuse and an old school London gangster. Joe’s grandfather, Daniel, was a clockmaker and Joe has chosen to follow almost religiously in his footsteps. He has given up his crown as a prince of the underworld and makes his living repairing clocks, windup toys, and other items made up of gears and cogs. The Spork legend lingers in the London undercity, but only like a hint of cigarettes and food the morning after a fabulous party. One day, Joe’s friend Billy brings him a clockwork book and then all hell breaks loose. Joe is soon on the run from the police, a secret government organization, and a cult. He is accompanied in his flight by Edie Banister, former client, former super spy, current octogenarian; her dog Bastion, world’s ugliest pug; and Polly, an administrative assistant of epic abilities and very, very intriguing toes. It’s a little bit steampunk, a little bit of a spy thriller, and utterly, totally awesome. 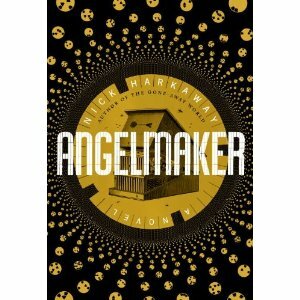 I am a huge fan of Nick Harkaway’s. His first book, Gone Away World, is still one of my favorites. It also had a pretty awesome cover. It was fuzzy. I may have used it like a teddy bear once or twice. I’m not saying I did. Just that I might have. He’s on Twitter, and he’s very nice. ← All British All the Time and a Giveaway!